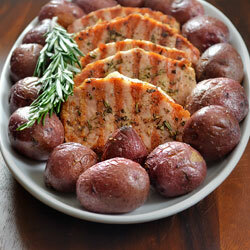 This is a simple and elegant meal, flavorful enough for a special occasion and easy to create while chatting up guests. It starts with mini-red potatoes tossed in olive oil and salt and pepper, then roasted in the oven - super simple! As always the potatoes need to be pierced with a knife or fork a few times so that they don’t become little potato bombs while cooking. 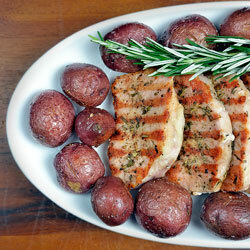 The loin chops feature fresh rosemary and is the only extra ingredient used here. 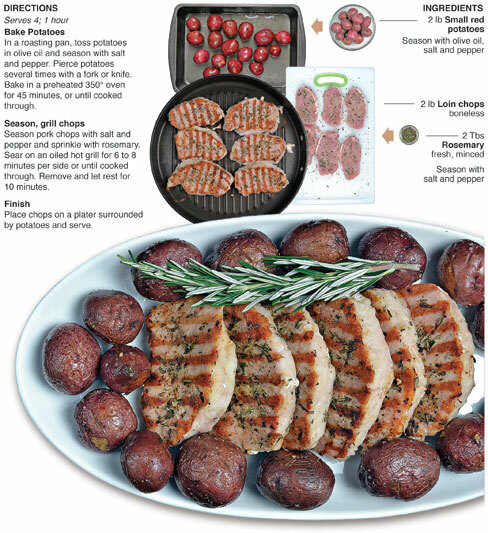 The rosemary’s pine-esque flavor helps give the chop a gourmet taste. I place the seasoned chops on the grill and left them alone for the first 7 minutes. This helped create the deep colored grill marks which adds to the presentation of the final dish. After one flip and a few more minutes the chops were done on the heat but I allowed them to rest for another ten minutes before serving, which helps keep all of the yummy goodness locked inside. I was surprised when this meal was finished. I was just creating a simple dinner and it turned out really elegant in flavor and presentation. One of the keys here is the grill marks on the chops. I oiled the grill before throwing them on and I think that really aided in giving them their golden-brown marks that made them look like they had been prepared in a restaurant. That, and the fact that I let them sit without moving or touching them for the first few minutes while they seared. I love to use rosemary. Once while I lived in New York I was visiting home and I made a batch of chops for a little party we were having for a late night snack. (Chops for a snack? yep, it was quite a party!) I used rosemary to flavor them and left the little leaves whole instead of mincing them up. I grilled the chops and put them out to everyone’s delight. Everyone stop pigging out and looked at me. I assured them that it was ok, and that it wasn’t grass, but rosemary, which was responsible for the wonderful flavor that the chops had. All was well after my explanation and everyone went back to their snack. Aunt Roxie did pick the little rosemary leaves from her chop before she ate it though. In a roasting pan, toss potatoes in olive oil and season with salt and pepper. Pierce potatoes several times with a fork or knife. Bake in a preheated 350° oven for 45 minutes, or until cooked through. Season pork chops with salt and pepper and sprinkle with rosemary. Sear on an oiled hot grill for 6 to 8 minutes per side or until cooked through. Remove and let rest for 10 minutes. 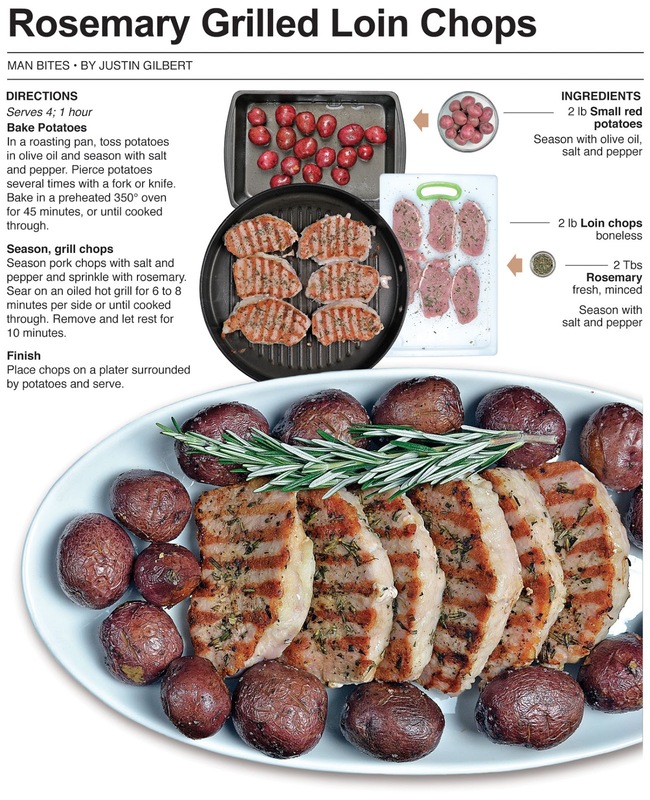 Place chops on a plater surrounded by potatoes and serve.